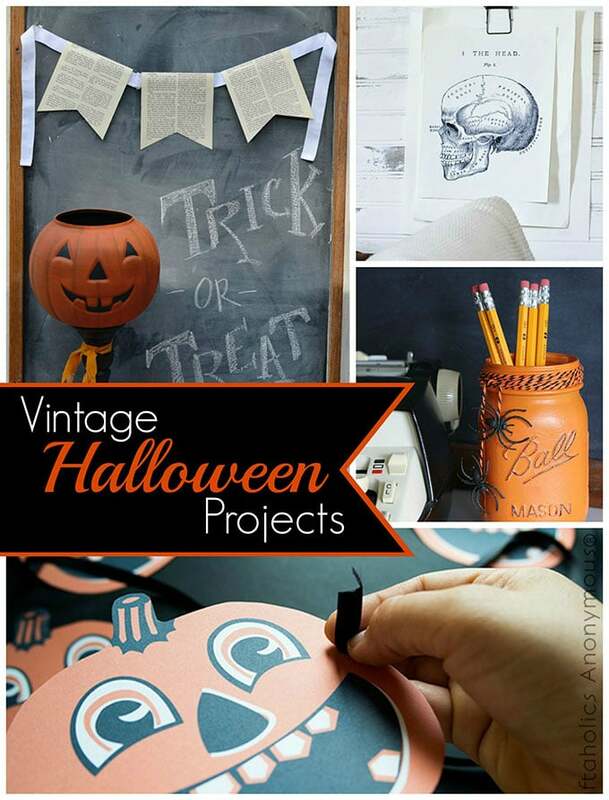 I’m throwing a vintage Halloween party. Sort of. I don’t know if I’ve ever done this on my blog before and I feel a little silly about it. But I have to confess. I’m lying to you. It’s just that this whole post is what I will call a “fantasy vignette”. 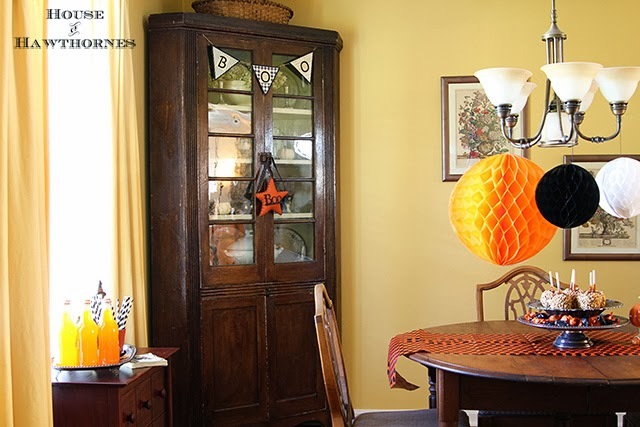 I had a bunch of vintage looking Halloween stuff in my dining room, but it looked a bit weak, so I added some items as if I were having a little party. I did not have a party. Your invitation did not get lost in the mail. It’s all a ruse to make my photos look more festive. BTW, the problem with a faux party is that you have food left over. I will need to find a way to eat 6 caramel apples in the next week or so before they go bad, because I am the only one in the house here that even remotely enjoys them. And my limit is normally one every other year. I feel a cavity coming on. I guess that’s what I get for lying to you. 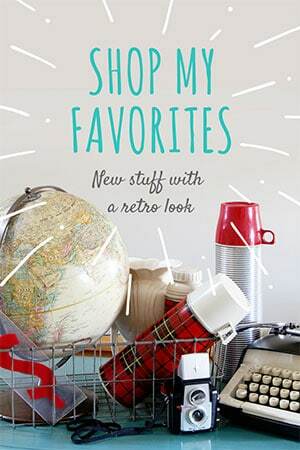 If you want to get a similar look, I’ve located some items that are close to what I used, although not the exact same items. If I lived closer, I would have crashed your party. 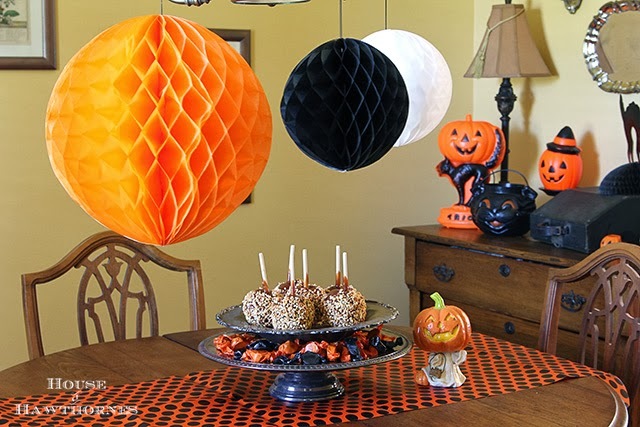 Love how you hung the honeycomb balls from your light fixture. Now I know what to do IF I EVER FIND ANY! Go to Target 🙂 I did find some actual vintage ones at the antique store but they were in really bad shape (like staples holding them together and rips) so I went with the vintage “styled” honeycombs. Love your pictures! The cat treat carrier caught my eye and I don’t even like cats! 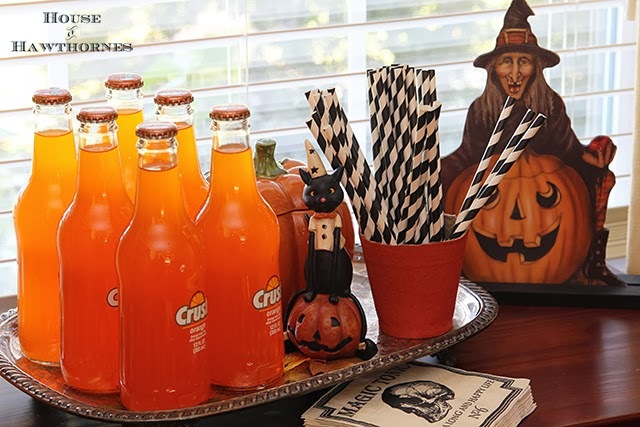 I’m loving the serving platter with your Orange Crush bottles and the fun drinking straws! If I were closer, I’d take a few of those apples off your hands. Yum! And there’s nothing wrong with a fantasy Halloween party. That’s coming from a grown woman who plays with sock monkeys. If it were a real party, it would be fun! 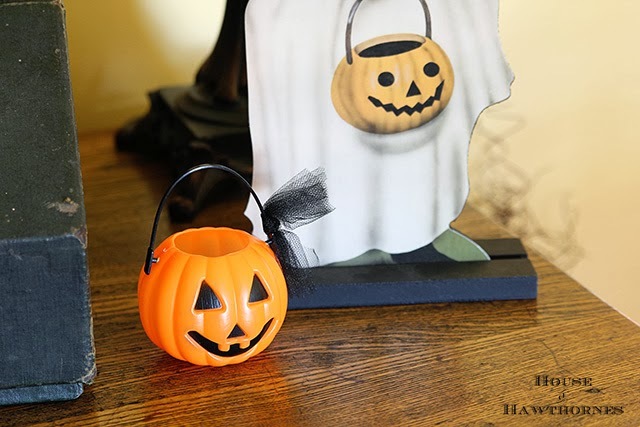 The Orange Crush is perfect for Halloween staging! 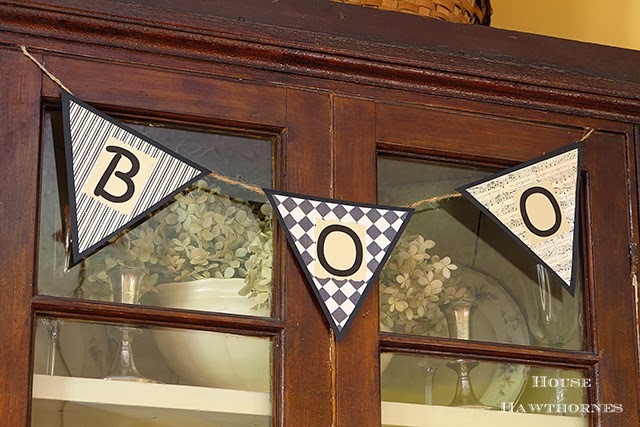 I love your pretend party, especially with the vintage feel. You really do have some wonderful treasures. With a pretend party you don’t have to have the carpets cleaned from all the extra guests. PS. 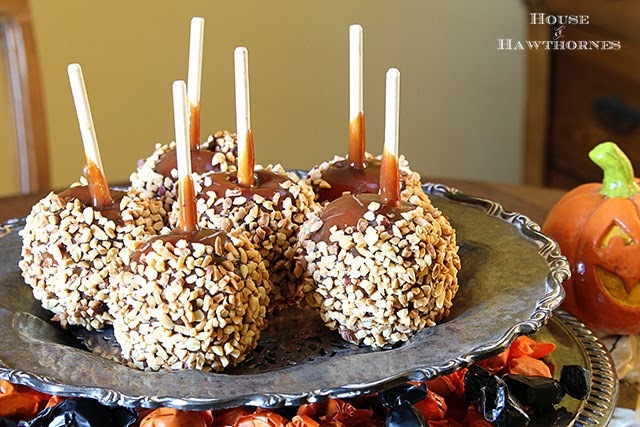 I’m still not sick of caramel apples and I’d offer to gobble up a few. A+ for extra effort.. of course there is the LYING thing to consider. LOL. 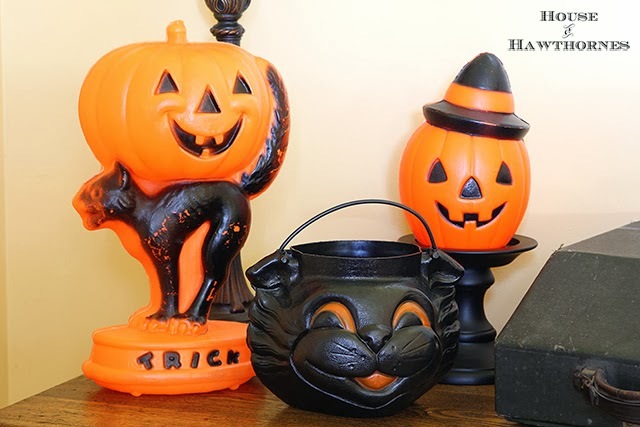 Seriously though — love your vintage decorations, and all of the orange and black. Looks great! 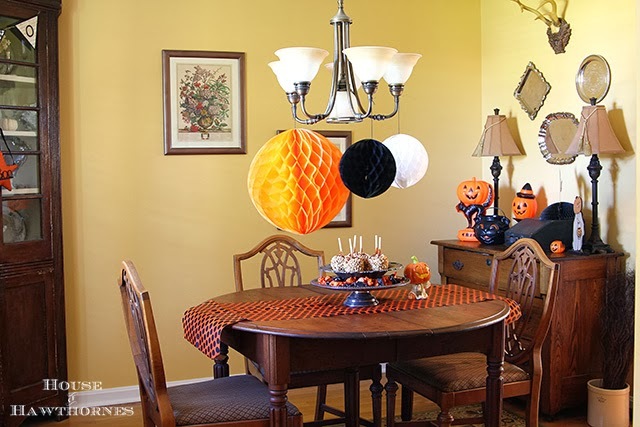 Yes, I love your Halloween decor for the party! You’ve given me some great ideas, as always! 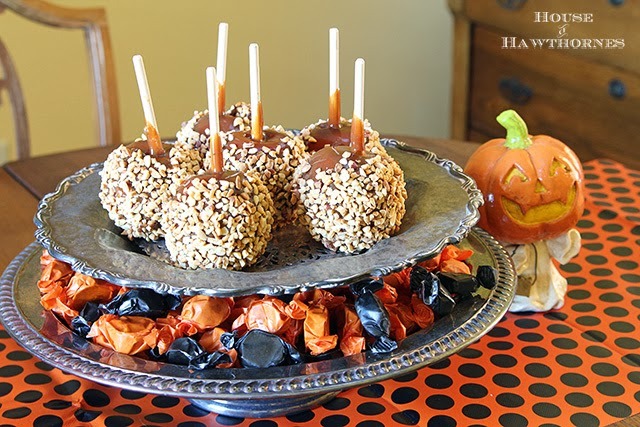 Love the Orange Crush and would love to share the caramel apples with you! Yum! Cute! It looks like a great party, if only in pics! I want to come to this party! Everything looks perfect. I bet you could make a pie using those caramel apples. Or an Apple Crisp of sorts. I bet it would be delish! Awesome idea, Shara!!! 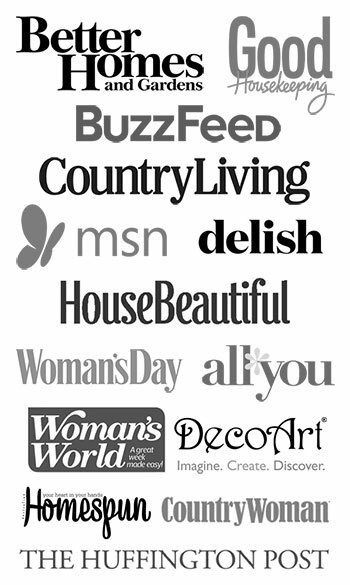 I’m off to Pinterest to check out some new pie recipes. 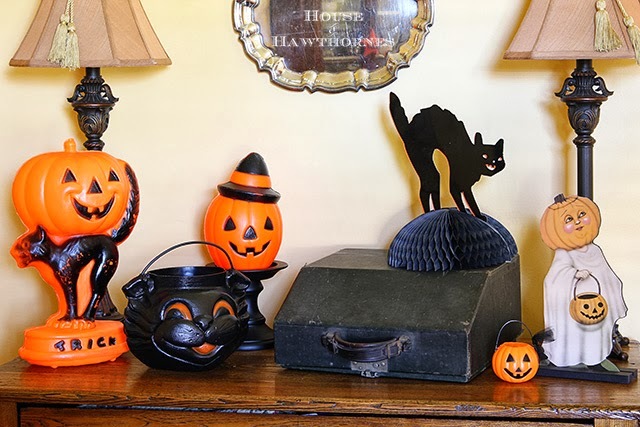 I love your vintage Halloween decorations! I have a group of Gurley candles lining my mantlepiece which I believe we’re popular back in the fifties. They were originally ten cents a piece. 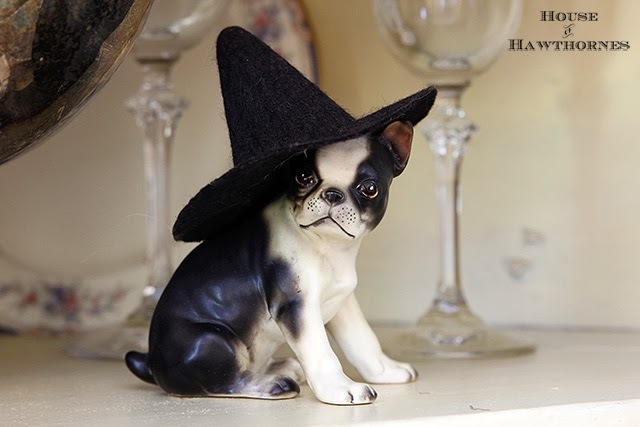 Oh, and the witch’s hat on the Boston Terrier is adorable! It’s not too late……I can still come for a real party. Love the dog’s at. The Orange Crush is perfect. I might borrow that. Love it all. Oh my gosh, funniest post ever! 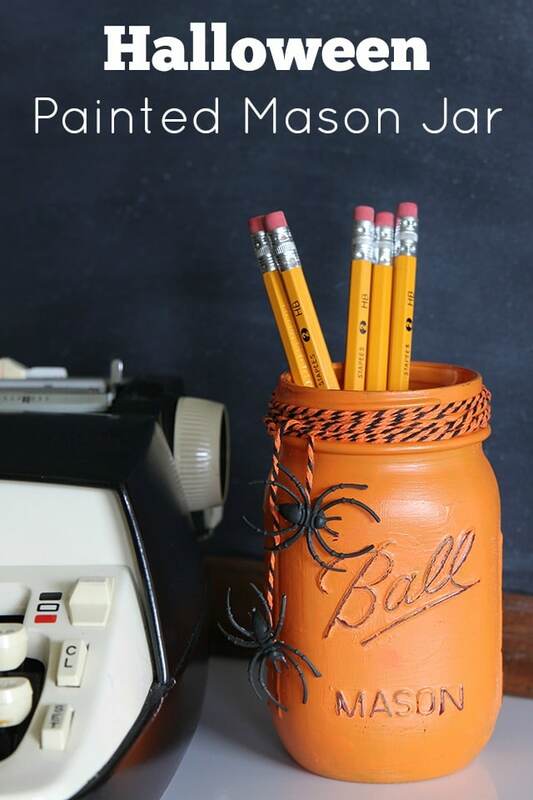 Love it and love your Halloween touches. I’d love a caramel apple right about now. Oh, and some orange soda. =) Coming over from Between Naps on the Porch. How have I not been following you all this time???????? very nice party if I would have been there. Seems like it was a lot of fun putting it together. All my favorites and then some. 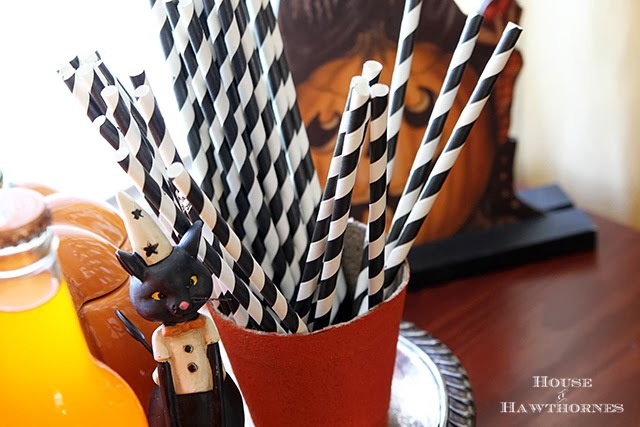 Your Halloween party decorations are so cute! The Pumpkin Head trick or treater is a cutie and so is the little dog with the witch hat on. “Real” party, or not, everything looks really festive. Good luck with the candy apples. When I was a kid, I always liked to gnaw off as much of the caramel and nuts as possible and leave most of the apple behind. What a marvelous idea. LOVE it. Everything looks festive, indeed. Love the fauxness of your party! 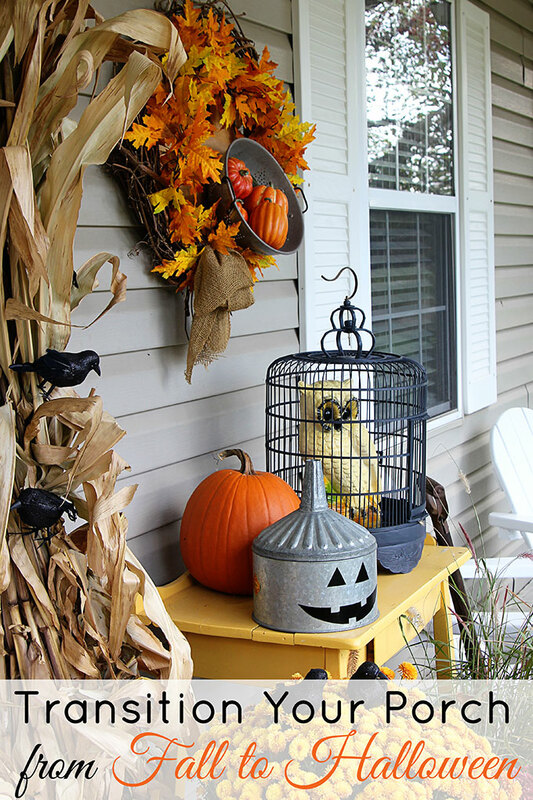 Invite the neighbors and make it a real party–it looks so festive! Looks like FUN! Now you’d better invite some friends over 🙂 Happy Halloween! 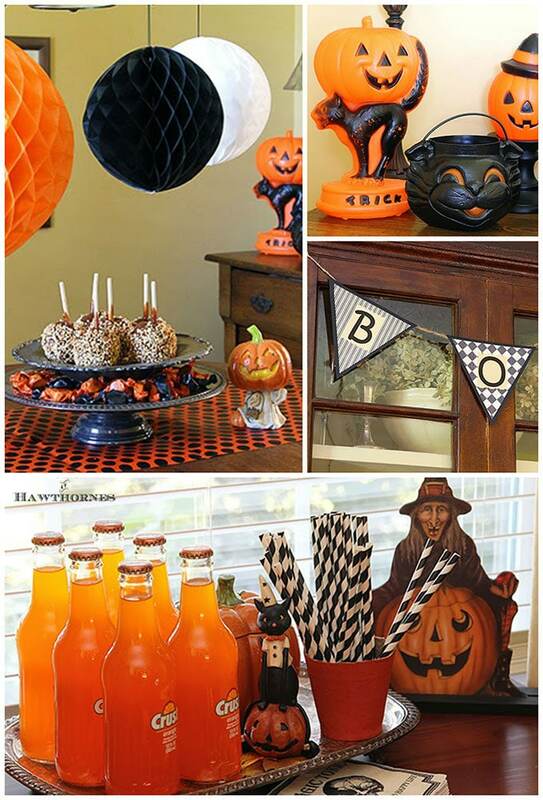 Very cute, I love vintage too and the Halloween vintage décor is just perfect. I love the cool cats. It’s great and you are ready for a party.